Surgery started yesterday, so for those of us working on the ward we had a free day, as there was nothing for us to do except get our bearings within the hospital and have a chance to all be together to ask last minute queries. We’re a bit down the “production line”, it takes a day or so after surgery for the patient to pass through ICU, and then on to our watch. The ward team consists of Beth, Helen, Cisco, Ele, Kate, Lisa, Inguna, myself (all nurses) and Nadia, our team physiotherapist. When things get into full swing, we’ll be working 24 hours a day, in three shifts starting at 0700, 1430 and 2130. We decided to go to town and meet at Bourbon Coffee at the MTN centre. Alas there are two of these one in town and one closer to the hospital. Ele, Kate + I made it, but the others spent a peaceful afternoon admiring the view in town. So we became 3. Phil, our cardiologist, gave us a mission to buy four lengths of material for him to take home. Well we launched into the shopping streets of Kigali, through the mayhem of parked cars, traffic & people, stepping around the wares for sale on the footpath until we came upon the fabric shop – there are many – and found for Phil beautifully patterned and coloured African fabric. It is made in the Congo as Rwanda no longer has this industry. We could buy it in 2m, 4m or 6m lengths. 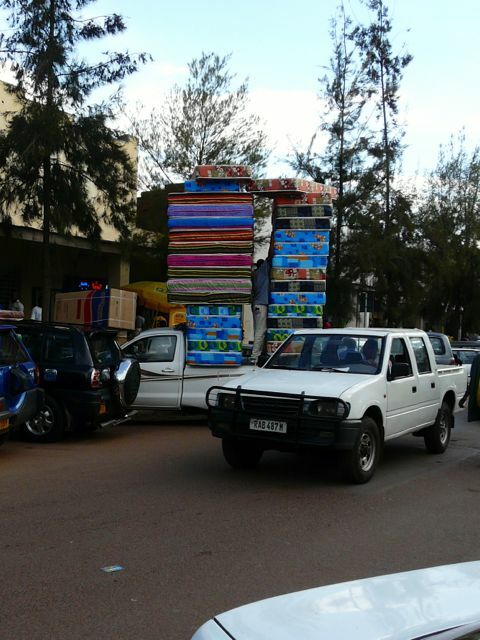 As we left and were perusing all manner of interesting stores there was a ute in the middle of the road with 2 stacks of brightly coloured mattresses stacked on the back. 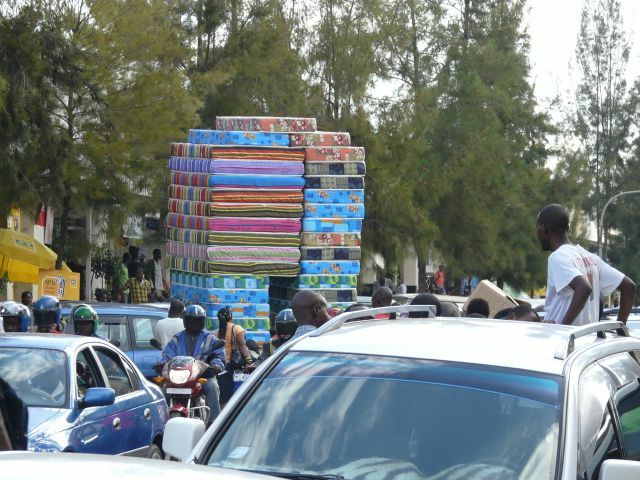 It looked as if he was trying to remove one or two from the top, and like a circus act this stack swayed to and fro until four tumbled off narrowly missing a bicycle and pedestrians. Onward we traipsed, now somewhat lost, past the mosque, then upstairs to enquire as to the price of massage and physio as our hotel beds are hard as sleeping on the floor. Perhaps we should have bought a mattress! We thought 8,000 Rwandan Francs (about $12 Aussie Dollars) for an hour was a bargain, and she should come and set herself up with the OHI team at the hospital! Enough antics by then, or so we thought, so we entered into negotiation with the taxi driver to return to the Top Tower hotel where we are staying. Cars in Kigali can either be left or right hand drive, although they drive on the right. Price decided and negotiated we got in the taxi. Lisa however goes to get in the front passenger seat, or so she thinks, but it is the drivers. He’s amused, we’re laughing. Lisa’s confused and the two little kids by the car are giggling, Ele has a couple of chuppa chups for them and all is well. We ended the day at Sol e Luna, an Italian restaurant with a beautiful view. Great day of checking out the town, and we’re ready for work and the ward to fill up with little patients!